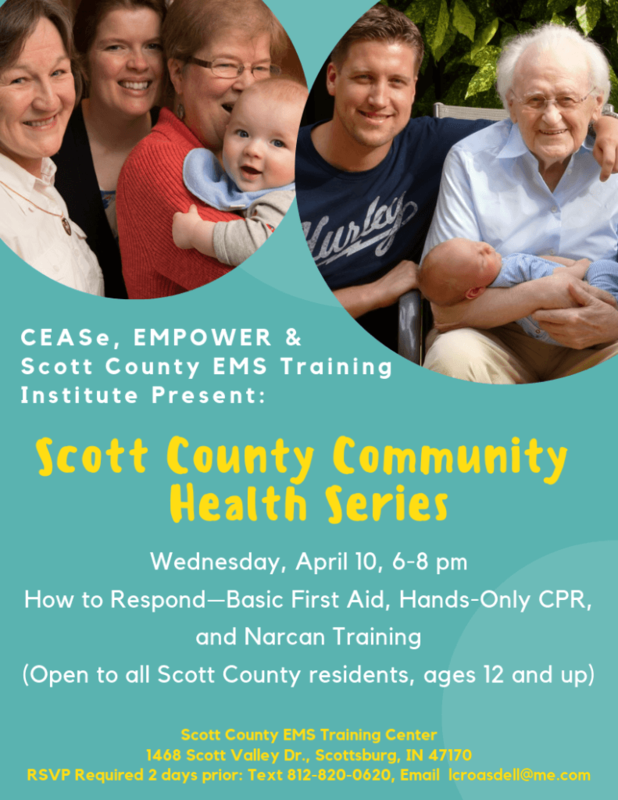 In a countywide collaborative effort, CEASe, EMPOWER, and Scott County EMS Training Institute present a Scott County Community Health Series with a ‘How to Respond” class open to all county citizens, including teens 12 and older. “We are excited to offer this great educational “how to ” class free to anyone in the community and hope people will take advantage of this valuable information session we are offering to our Scott County families,” says Tammy Davis, EMS Trainer. The Scott County Community Health Series sessions will take place at the Scott County EMS Training Center, 1468 Scott Valley Drive, Scottsburg, IN, where participants can enter in the back of the building. For overflow parking, attendees may park in the parking lot adjacent to the training center. The next workshop will be on Wednesday, April 10, 6-8 pm: How to Respond—Basic First Aid, Hands-Only CPR, and Narcan Training; Free blood pressure screenings and free blood glucose checks. If you would like to attend any of the “How to” classes, please RSVP by texting 812-820-0620 or email lcroasdell@me.com at least two days prior to each event.